The RStudio addins manager was recently introduced and makes for great tool. Spread the word! My favourite addin by far is the ggplot theme assist addin, helping you to organize your ggplot! I’m reblogging this from: https://csgillespie.wordpress.com/2016/04/01/rstudio-addins-manager/ Thanks to Colin Gillespie! RStudio addins let you execute a bit of R code or a Shiny app through the RStudio IDE, either via the Addins dropdown menu or with a keyboard shortcut. 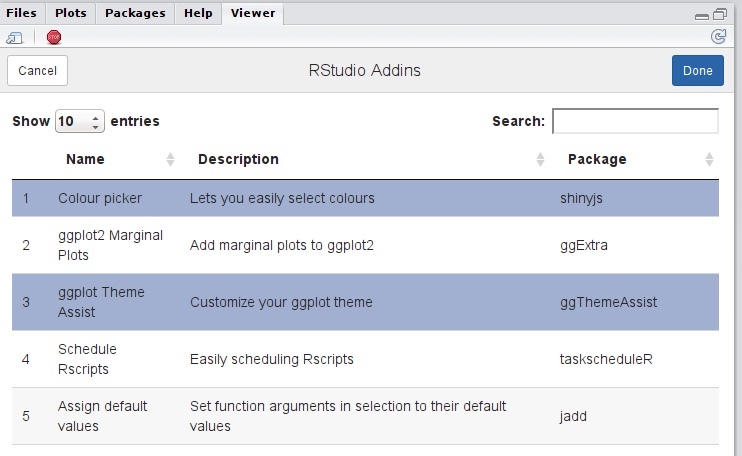 This package is an RStudio addin for managing other addins. To run these addins, you need the latest version of RStudio. In the screenshot above, the highlighted addins, shinyjs and ggThemeAssit, indicate that this addins have already installed. Highlighted addins will be installed. Un-highlighted addins will be removed. Package. If the package is only on github, use name/repo. The initial list of addins was obtain from daattali’s repo. I’m reblogging this from: https://github.com/calligross/ggthemeassist Thanks to user calligross! ggThemeAssist is a RStudio-Addin that uses the rstudioapi package and provides a GUI for editing ggplot2 themes. For a full list of features see NEWS. On linux and windows, please ensure that you’ve installed at least shiny version 0.13.1. We realized shorty after the cran release that there is an issue with smaller screens. Some users may expirience an unapropiate sized plot. This issue has been fixed in version 0.1.1, which can be installed from github (please see below). Please be aware that you need the most recent (stable) release of RStudio (v0.99.878 or later). Additionally, ggThemeAssist depends on shiny and miniUI. We advise users to install from github. Due to CRAN policies and the rapid development of ggThemeAssist, many new features and bugfixes will be available on CRAN several weeks later. After installing, ggThemeAssist is available in the Addins menu within RStudio. To edit ggplot2 themes, just highlight a ggplot2 object in your current script and run the Addin from the Addins menu. ggplot2 will analyze your current plot, update its defaults to your current specification and give you a preview. Use the input widgets to get your ideas into shape. After terminating ggThemeAssist a character string containing your desired changes in standard ggplot2 notation is inserted in your script. Re-running your script now produces the plot you just configured using ggThemeAssist.